Patriots owner Robert Kraft expressed anger and frustration at the NFL's harsh sanctions over the Patriots' use of deflated footballs in the first half of their 45-7 AFC Championship Game victory over the Colts. In his first public comments since the team was penalized with the removal of two draft picks, a $1-million fine and a four-game suspension of quarterback Tom Brady, Kraft insisted that the Patriots and Brady did not do anything wrong and do not deserve to be punished. "I just get really worked up. To receive the harshest penalty in league history is just not fair," Kraft told Peter King of SI.com in an article published Monday morning. "The anger and frustration with this process, to me, it wasn't fair. If we're giving all the power to the NFL and the office of the commissioner, this is something that can happen to all 32 teams. We need to have fair and balanced investigating and reporting. But in this report, every inference went against us . . . inferences from ambiguous, circumstantial evidence all went against us. That's the thing that really bothers me." Kraft was referring to a 243-page report by attorney Ted Wells, who was hired by the NFL in January to investigate the matter. Wells concluded that it was "more probable than not" that the Patriots purposely deflated the footballs to below NFL specifications and that Brady was "at least generally aware" of those actions. "If they want to penalize us because there's an aroma around this? That's what this feels like," Kraft said. "If you don't have the so-called smoking gun, it really is frustrating. And they don't have it. This thing never should have risen to this level." Kraft said he believes Brady when the quarterback tells him he is innocent in the matter. "We had the discussion -- if you did it, let's just deal with it and take our hit and move on," Kraft said. "I've known Tommy 16 years, almost half his life. He's a man, and he's always been honest with me, and I trust him. I believed what he told me. He has never lied to me, and I have found no hard or conclusive evidence to the contrary." Kraft did not say whether the Patriots will challenge the penalties handed down by the NFL. Brady, through the NFL Players Association, has appealed his suspension. NFL commissioner Roger Goodell will hear the appeal, which must take place within 10 days of last Wednesday's suspension announcement. Asked about his relationship with Goodell, Kraft said, "You'll have to ask him." 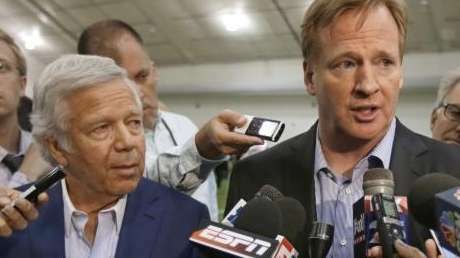 Kraft and Goodell have developed a very close relationship over the years, with Kraft supporting the commissioner during the league's lockout in 2011 and again when Goodell came under fire for his admittedly poor handling of Ray Rice's two-game suspension for hitting his fiancee in the elevator of an Atlantic City casino in February 2014. Kraft suggested there were some major problems with the NFL's handling of the footballs during the game, including the fact that on-field officials used two different gauges to measure the pressure. "[Referee Walt] Anderson has a pregame recollection of what gauge he used, and it's disregarded, and the [Wells] report just assumes he uses the other gauge," Kraft said. "Footballs have never been measured at halftime of any other game in NFL history. They have no idea how much footballs go down in cold weather or expand in warm weather. There is just no evidence that tampering with the footballs ever happened."